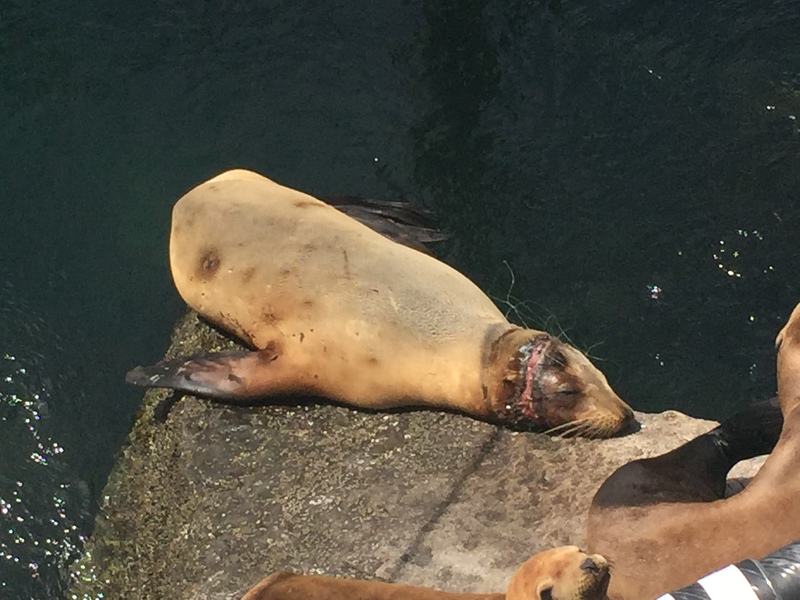 Trash, lost fishing gear, and grocery bags in the water or washed up on levees and beaches are harmful to wildlife and the quality of recreation, and pose serious threats to safety in our waterways. Marine debris can wrap around boat propellers and clog boat intakes, causing costly engine damage and becoming a safety hazard. 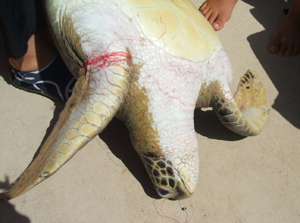 Some marine debris such as cigarette filters, trash and grocery bags and small plastic pieces look like food to animals. Once ingested, these materials can cause suffocation and/or starvation. 1 Moore, C. J., S. L. Moore, M. K. Leecaster, and S. B. Weisberg, 2001. A comparison of plastic and plankton in the North Pacific Central Gyre. In: Marine Pollution Bulletin 42, 1297-1300. WHAT CAN I DO TO REDUCE WASTE AND PROPERLY STASH MY TRASH? Help guests understand that on your boat, no trash is thrown overboard. Put empty cans back in your cooler to recycle ashore. Remove product packaging at home to eliminate space-consuming packaging waste onboard. Find ways to reduce the amount of garbage you create while aboard your boat. For example, pack food from home in reusable containers rather than disposable food bags. Take used fishing line back to recycling bins at your marina or tackle shop, or send it directly to: Berkley Recycling Center, 1900 18th Street, Spirit Lake, IA 51360-1099. Shrink wrap is a low-density polyethylene used to protect boats during the winter. Shrink wrap is not biodegradable, and can become a disposal problem at landfills. Many marinas offer shrink wrap recycling programs. If your marina does not offer shrink wrap recycling on site, there are companies that for a fee will send you a postage paid bag that can be filled with shrink warp and returned to the company for recycling. For more information visit www.dr-shrink.com. Participate in a local marina or beach clean up. Call (800) COAST4U or visit www.coast4u.org for organized events in your area. 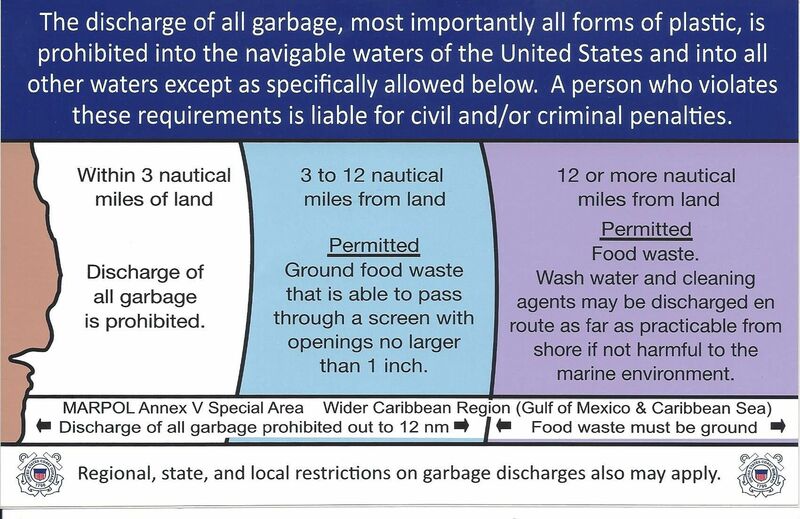 Federal law now required all boats 26 feet or more in length, when operating in waters under U.S. jurisdiction, to display an informational placard on federal marine pollution prevention laws. You must display the required placard detailing these prohibitions in a prominent location where passengers and crew can read it. The placard must be 40 square inches as minimum size. They can be purchased at marine supply dealers.